Dual Automatic Locking Hubs (D-ALH) are standard, as is the previous High Country Pack option with front and rear diff locks. This is the double cab variant. Toyota’s rugged and dependable Land Cruiser 70 Series has been updated for 2017 with revisions to the model range, significant safety improvements, and a digital upgrade. Apart from a slightly remodelled bonnet, the 70 Series exterior is unchanged. However, there is a raft of changes lurking underneath the utilitarian styling that doesn’t look much different than when it was introduced more than three decades ago. The truck meets EURO 5 emission regulations with the introduction of a Diesel Particulate Filter. Vehicle Stability Control, Active Traction Control, Electronic Brake-force Distribution, Hill-start Assist Control, Brake Assist and a reversing camera are standard across the five variant range. 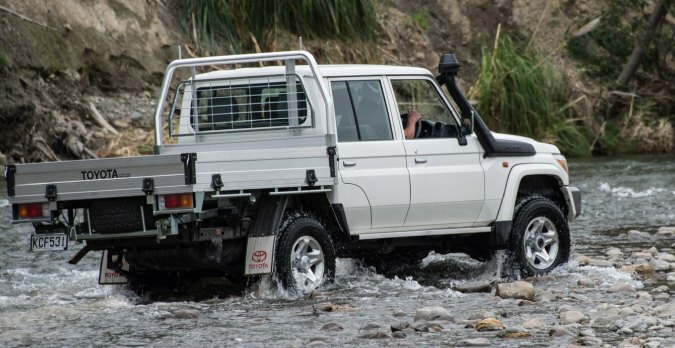 Starting from $75,780, the Land Cruiser 70 Series has both single and double cab variants available in LT and LX grades. The Troop Carrier now adopts the Wagon name and is available as an LT grade; it is the ultimate blank canvas with two seats and van-like cargo space. The double cab’s rear seat area has a reasonable amount of leg room (left). The interior, which is very much a case of function over form, now has a handful of modern convenience and safety features (right). Land Cruiser 70 Series continues with a 151kW, 430Nm 4.5-litre V8 turbo diesel engine but features improvements in performance and efficiency due to the new fuel injectors. Combined CO2 emissions are down to 281g/km, alongside combined fuel consumption reductions resulting in an 8-10 per cent decrease from the outgoing model. A suite of technology had dragged the 70 into the digital age with cruise control as standard, a 6.1” display audio unit with Bluetooth connectivity, CD player and USB port. The display also performs as a monitor for the reversing camera. Single cab variants receive additional enhancements to improve the structural integrity of the cabin and a chassis that is larger and stiffer, and now they have the maximum 5-star ANCAP safety rating. Side curtain airbags and a driver’s knee airbag, adjustable seat belt anchors with pre-tensioners and an Emergency Stop Signal (ESS) complete the single cab’s safety feature overhaul.